The Robertians, or Robertines, was the Frankish predecessor family of origin to the ruling houses of France; it emerged to prominence in the ancient Frankish kingdom of Austrasia as early as the eighth century—in roughly the same region as present-day Belgium—and later emigrated to West Francia, between the Seine and the Loire rivers. The members were ‘forefathers’ of the Capetian dynasty. 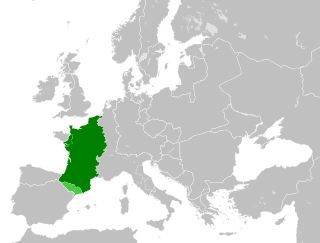 With fealty (sometimes mixed with rancor) to the Carolingians, they held the power of West Francia through the whole period of the Carolingian Empire; and from 888 to 987 theirs was the last extant kingdom of that house until they were succeeded by their own (Robertian) lineage, the house of Capet. The family frequently named its sons Robert, including Robert of Hesbaye (c. 800), Robert III of Worms (800–834), Robert the Strong (d. 866) and Robert I of France (866–923). It figured prominently amongst the Carolingian nobility and married into this royal family. Eventually the Robertians themselves delivered Frankish kings such as the brothers Odo (reigned 888–898) and Robert I (r. 922–923), then Hugh Capet (r. 987–996), who ruled from his seat in Paris as the first Capetian king of France. Although Philip II was officially the last king of the Franks (rex Francorum) and the first king of France (roi de France), in (systematic application of) historiography, Hugh Capet holds this distinction. He is the founder of the Capetians, the royal dynasty that ruled France until the revolution of the Second French Republic in 1848—save during the interregnum of the French Revolution and Napoleonic Wars. It still reigns in Europe today; both King Felipe VI of Spain and Grand Duke Henri of Luxembourg are descendants of this family through the Bourbon cadet branch of the dynasty. The oldest known Robertians probably originated in the county Hesbaye, around Tongeren in modern-day Belgium. The first certain ancestor is Robert the Strong count of Paris, probably son of Robert III of Worms, grandson of Robert of Hesbaye, and nephew of Ermengarde of Hesbaye, who was the daughter of Ingram, and wife of Louis the Pious. Other related family includes Cancor, founder of the Lorsch Abbey, his sister Landrada and her son Saint Chrodogang, archbishop of Metz. The sons of Robert the Strong were Odo and Robert, who were both king of Western Francia and ruled during the Carolingian era. His daughter Richildis married a count of Troyes. 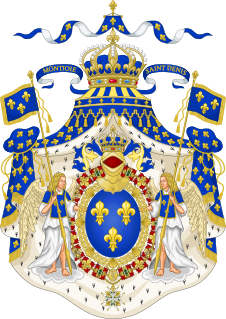 The family became Counts of Paris under Odo and "Dukes of the Franks" under Robert, possessing large parts of the ancient Neustria. Although quarrels continued between Robert's son Hugh the Great and Louis IV of France, they were mended upon the ascension of Lothair I of France (954–986). Lothair greatly expanded the Robertian dominions when he granted Hugh Aquitaine as well as much of Burgundy, both rich and influential territories, arguably two of the richest in France. The Carolingian dynasty ceased to rule France upon the death of Louis V (d. 987). After the death of Louis, the son of Hugh the Great, Hugh Capet was chosen as king of the Franks, nominally the last ruler of West Francia. Given the resurgence of the Holy Roman Empire title and dignities in the West Francian kingdom, Europe was later believed to have entered a new age, so became to be known in historiography as the first king of France, as western civilization was perceived to have entered the High Middle Ages period. Hugh was crowned at Noyon on July 3, 987 with the full support from Holy Roman Emperor Otto III. With Hugh's coronation, a new era began for France, and his descendants came to be named, after him, the Capetians. They ruled France as the Capetians, Valois, and Bourbons until the French Revolution. They returned after 1815 and ruled until Louis Philippe was deposed in 1848. However they continue to rule Spain, with two republican interruptions, through the Bourbon Dynasty right down to Felipe VI. ^ Urbanski, Charity (2013-09-20). Writing History for the King: Henry II and the Politics of Vernacular Historiography. Cornell University Press. p. 160. ISBN 9780801469718. ^ Bourchard, Constance Brittain (1999). "Burgundy and Provence:879–1032". In Reuter, Timothy; McKitterick, Rosamond; Abulafia, David (eds.). The New Cambridge Medieval History: Vol. III, c.900 – c.1024 (Link is extract=Volume III, Chapter 1 "Introduction: Reading the Tenth Century") (PDF). III (1. publ. ed.). Cambridge: Cambridge University Press. p. 336. ISBN 0521364477. Retrieved 28 Feb 2013. Pierre Riché. The Carolingians, a Family who Forged Europe. University of Pennsylvania Press. Christian Settipani and Patrick van Kerrebrouck. La Préhistoire des Capetiens, Premiére Partie: Mérovingiens, Carolingiens et Robertiens. Odo was the elected King of Francia from 888 to 898 as the first king from the Robertian dynasty. Before assuming the kingship, Odo held the title of Count of Paris. Robert the Strong was the father of two kings of West Francia Odo and Robert I of France. His family is named after him and called the Robertians. In 853 he was named missus dominicus by Charles the Bald, King of West Francia. Robert the Strong was the great-grandfather of Hugh Capet and thus the ancestor of all the Capetians. 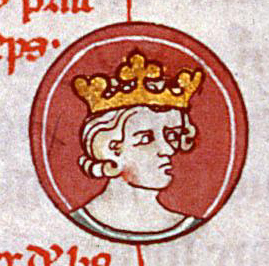 Matilda of France, a member of the Carolingian dynasty, was Queen of Burgundy from about 964 until her death, by her marriage with King Conrad I.